Second Chance for "Golden-Voiced" Homeless Man? 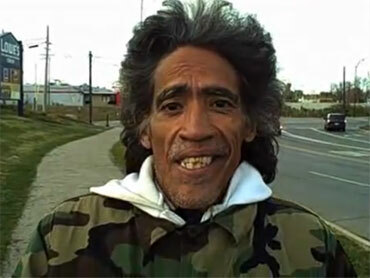 Get ready to start hearing about Ted Williams - not the baseball player but the "golden voiced" homeless man about to get a second chance in Columbus, Ohio. Williams, a panhandler near Interstate 71, solicits donations with a sign saying that he's an ex-radio announcer with a "god-given gift" who has fallen on hard times. A reporter from the Columbus Dispatch spoke to him and the result was an amazing video in which Williams demonstrates his soothing croon and explains how he went from a successful career to panhandling. Williams describes meeting a radio announcer at age 14 who told him that radio is "theater of mind." "I just said, well, hey. I can't be an actor, I can't be an on-air personality, but the voice just became something of a development over the years and I went to school for it," Williams says. "And then alcohol and drugs and a few other things became a part of my life. I've got two years clean, and I'm trying hard to get it back. And hopefully somebody from one of these television or radio stations will say, 'hey, I need a voice-over,' or ' I need something.'" The story doesn't end there. The clip is gaining traction on YouTube and commenters have already begun offering Williams possible job opportunities in Columbus. And a local morning radio show - Dave and Jimmy on Clear Channel-owned WNCI - will be interviewing Williams Wednesday and has hinted it might offer him work. "We're going to find some way to help this guy!" the morning duo proclaims on the show's Facebook page.